Loaded with pizza sauce, fresh mozzarella cheese, pepperoni and seasonings, these Pizza Potato Skins are sure to be a crowd-pleasing appetizer or snack! Let’s talk about potatoes today. Carb-loaded and full of starch. I’m a potato fan. Baked, broiled, mashed, steamed, roasted, or fried, I pretty much like any potato that comes my way. From these Garlic Parmesan Smashed Potatoes, to those Broccoli Cheddar Stuffed Baked Potatoes and these Herb Roasted Potatoes, I love them all. But then there’s the outcast…potato skins. My feelings on these little guys are somewhat distorted. Even loaded with cheese, bacon, and sour cream, I just don’t swoon over potato skins like I do their cousins. I don’t hate ’em, but I could definitely live without ‘em…until now. 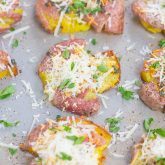 I took an average potato skin and gave it a delicious makeover, creating these zesty Pizza Potato Skins! 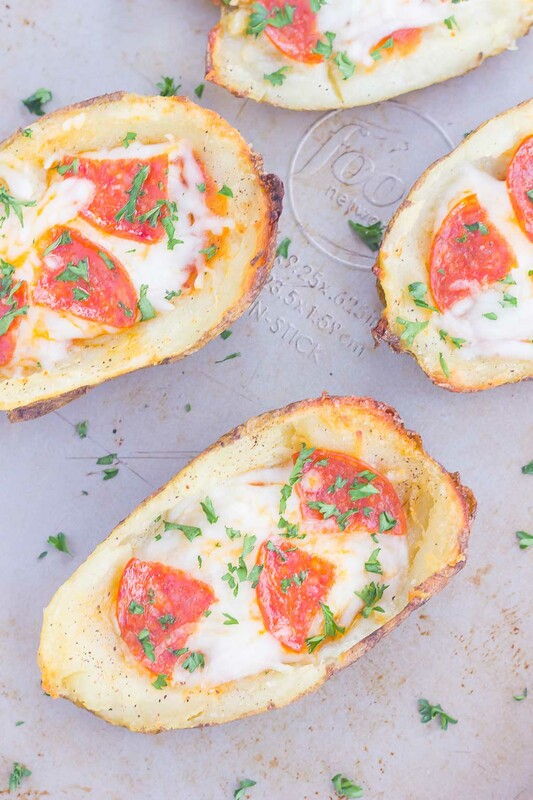 Loaded with pizza sauce, fresh mozzarella cheese, pepperoni and seasonings, these potato skins are sure to be a crowd-pleasing appetizer or snack! And because everyone likes pizza, who can resist these perfectly proportioned appetizers? I don’t know about you, but I could eat appetizers for dinner every so often. There’s just something about snacking on some delicious foods that cures my cravings. 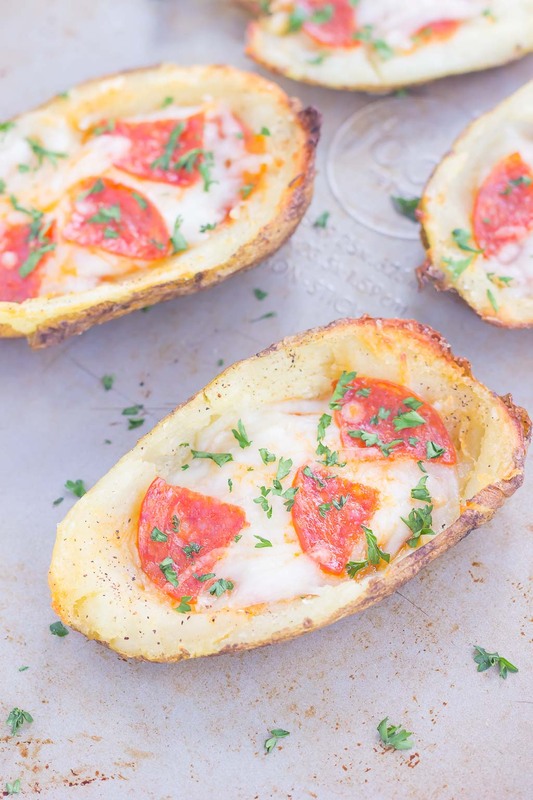 And these Pizza Potato Skins would definitely be on the menu! Just like my Restaurant Style Salsa and this Cobb Salad Dip, these potato skins are a breeze to whip up. Simply scoop out the insides of your potatoes, bake, layer with pizza sauce, cheese, pepperoni (or your desired toppings), season, and broil. That’s it! Perfectly crisp and delicious potato skins that tastes like pizza. And because these Pizza Potato Skins are so versatile, feel free to add your favorite toppings, adjust the seasonings, or swap out pizza sauce for Alfredo sauce. The combinations are endless! So the next time your in the mood to jazz up an old favorite or are hosting a party, try out these Pizza Potato Skins! I promise you’ll never go back to plain ‘ole potato skins again! Looking for more appetizer recipes? I’ve got you covered! Prick each potato with a fork, place onto a medium baking pan and bake for about 50 min, or until tender on the inside. Remove from oven. Then set oven to broil. Cut each potato into three sections, lengthwise, so that you end up with two ends and a middle. Set the middle aside, as it isn't needed to make these skins (I baked the middles along with the potato skins). Using a melon baller or spoon, scrape out the inside of each potato half, leaving about a 1/2 inch of filling. Brush each potato skin with melted butter and season with salt and pepper. Place potatoes on baking pan and broil for two minutes on each side. Then remove from oven. Top each potato with pizza sauce, cheese, pepperoni, Italian seasoning, salt and pepper. Broil for an additional 3-4 minutes, or until cheese has fully melted. Serve with a side of warmed pizza sauce, if desired. Potato skins will keep in the refridgerator for up to three days. I thought this was actually pizza when I saw the photo! It's trickery! I loveeee appies for a main course every now and again. So fun and decadent. Plus, I feel like I can eat more of them because they're smaller hehe. Pizza flavours and potatoes are a match made in heaven, their muted flavour really pairs well with tomatoes and of course, bubbling cheese! What a great take on a potato skins, Gayle! I'd much rather have these any the usual potato skins you see -they always seem so, meh. No longer! Glad it was a good trick, Allison! I really enjoyed these potato skins with the pizza flavors. It jazzed up the potatoes and was fun to eat! Love this idea! I like making pizza with portobello mushroom caps, but using potato skins sounds even better! Delicious! Oh that's a great idea too, Mir! I will have to try that, because mushrooms are my weakness! There are so many fun ways to jazz up potato skins, too. Thanks, Bri! I was so excited that I liked these way better than regular potato skins. And they're so easy to make, too! what a GREAT idea Gayle! they look really good! I'm actually a fan of potato skins :-) yum! Pinned! 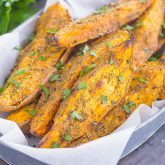 Sounds like these are the perfect potato skins for you, Michele! Who wouldn't love tons of cheese and pepperoni on these babies, right?! And thanks so much for the pin! These look so tasty! What a clever way to get your pizza fix! Thanks, Kelly! 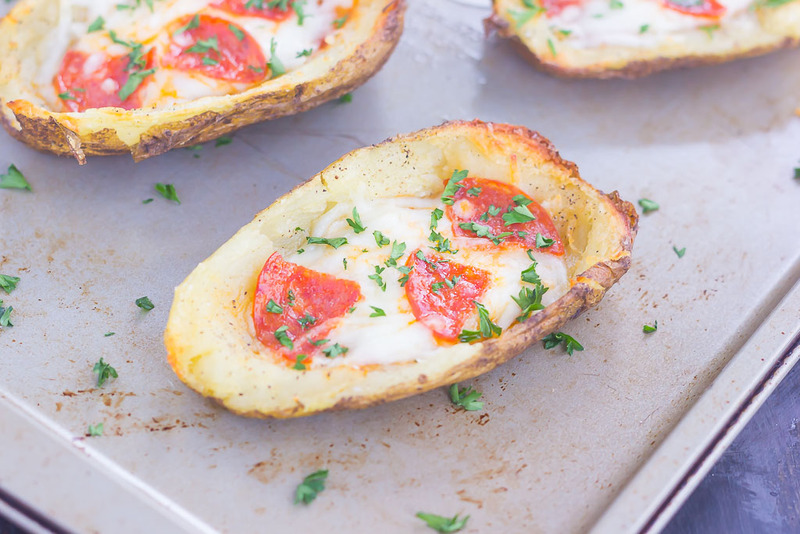 I could eat pizza every day, and now that I tried these potato skins, I'm hooked! I will take potatoes in any form or fashion! I love how creative this is! And I agree, I could eat appetizers for dinner all the time too! Thanks, Annie! This is definitely a fun way to spice up some regular potato skins. And it makes a perfect dinner, too! I'm having a duh moment right now, like, hmmm, why didn't I think of this concept? This must be the ultimate comfort food, like that thing you make for a friend who needs a quick pick-me-up that pops over for lunch. Or, you make for your kids, because c'mon, what kid wouldn't love these? Potatoes and pizza combo, nourishing and delicious, wow! I have those duh moments all the time, Laura! And I agree, definitely a comfort food of sorts. And this would be a great meal for kids! I'm sure they would enjoy putting their own toppings on these potatoes! I rarely eat baked potatoes anymore -- they can be a little dull. There's nothing dull about these babies, however! I'd definitely be onboard with these, and my kids would love 'em! 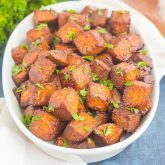 I agree, plain potatoes can be a little boring, but I think you and your kids would love these! Nothing dull about these potato skins, and you can customize them just the way you want! You must try these potato skins soon, Medha! I think you would love them! This is such a fabulous idea! I need some of these now! 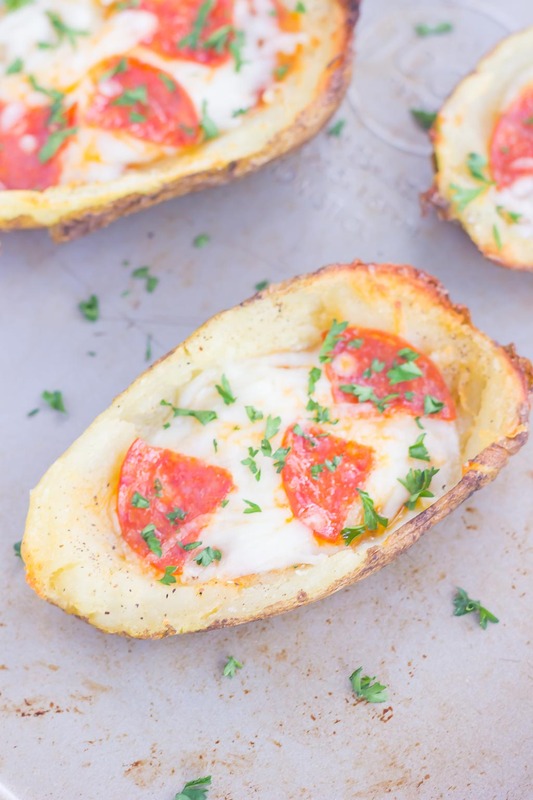 If you love potato skins, I think you would love them stuffed with pizza toppings! Thanks for stopping by! Thanks, Arpita! This is a fun way to jazz up a regular potato. I hope you family and friends love them! Gosh you're a potato genius! Love potatoes, love pizza, love carbzzzz. I could eat this everyday for lunch and not complain! Carbs are definitely the best! Especially these potato skins stuffed with pizza toppings! I'm a potato lover too, it's like the ultimate comfort food. I'm totally with you too on making a dinner out of appetizers, I love them! I love these potato skins! Pizza + Potatoes = my two favorite things! Thanks, Danielle! I'm glad you share my love of appetizers for dinner! It's fun to do that every once in a while. Especially with these pizza potato skins! What a fun idea! I love the mini pepperonis-- they are so stinkin' cute! Thanks, Jess! I love the mini pepperonis too...I had a hard time not eating them before I put them on the potato skins! Mmmm potatoes! I love potatoes! And combined with pizza? Even better! I love doing appetizers for dinner every so often too! Sometimes we go as simple as a cheese plate - sooo good! It's so fun to switch up dinner with just appetizers. Then you can sample a little bit of everything! These look so fun! Love the mini pepperoni too. Thanks, Shikha! I loved using the mini pepperonis, perfect size for these potatoes! There are so many ways to cook potatoes that I love trying out different ways. I hope you love these potato skins if you try them, Izzy! I LOVE potatoes. I must say, THIS is a genius idea! Pizza on a potato skin. Yum Mee! Thanks so much, Michele! It's so fun to eat these potato skins with pizza toppings! these look delicious gayle! craving one now... love the pizza flavour. Thanks, Thalia! If you love pizza, I think you'll love these potato skins! OMG!!!!! I can eat potatoes in absolutely ANY FORM too! They are just so versatile. Gayle, this is such an amazingly brilliant idea!!!!! A pizza in potato skins is EXACTLY my kind of a pizza! LOVE IT! Thanks, Samina! This appetizer will cure your pizza and potato cravings! These are the cutest potato skins I have ever seen! My husband would love these, and they would be so perfect for a football party! Definitely bookmarking this one! Thanks so much for the kind words, Cate! These would definitely be perfect for football season! Wow, these look just like a pizza! But with all that potato skin goodness instead of a crust ... genius! I love these, Gayle, plus I always struggle a bit to get my pizza crust right, so maybe this is the way to go! Wow, these would be the perfect appetizers for game days! The combination of pizza and potato skins is making my mouth water! Thanks, Ashley! My husband already requested that I make these for football games, so I'm sure these would be perfect for your house, too! What a great idea! I'm here like why have I never thought of this?! Ha ha thanks, Jessica! Now that I've made these pizza potato skins, my head is spinning with different ideas! This is most definitely the best idea for potato skins I've seen in a long time- so delicious!! Thanks, Sue! It was fun coming up with this idea, and definitely makes potato skins more appetizing to me! Love potatoes and love pizza! You just combined my two favorite things, so yummy! Thanks, Katie! It was a fun dish to test out! These are definitely swoon-worthy!!! And they are potato skins that I would actually get excited about! I'm kind of like you with potato skins but top it with pizza toppings and I'm in! Thanks, Lindsey! Pizza is always I hit, so I thought why not try it with potato skins?! We used to do something like this at a hole in the wall restaurant. Any baked potatoes we didn't sell in a shift got converted in to appetizer skins and frozen. Instead of broiling to crisp them up, we fried them coming out of the freezer. The scraped innards got added to seasoning salt and paprika to make homefries for the breakfast menu. It was a simple/tasty way to *reuse* trash items. If skins or hashbrowns started to pile up, we started doing two-fers on the appetizer and adding free homefries to breakfast plates if desired. Love potatoes! This is such a great, creative way to cook them! Pinning! Thanks, Sarah! I'm in love with pizza anything! Yep, it's official, I want those pizza potato skins all up in my mouth. Seriously, they look amazing! Love the photos, these look so delicious. I'm always look so delicious and fun! Pinning. Thanks for the potato love and pin, friend!